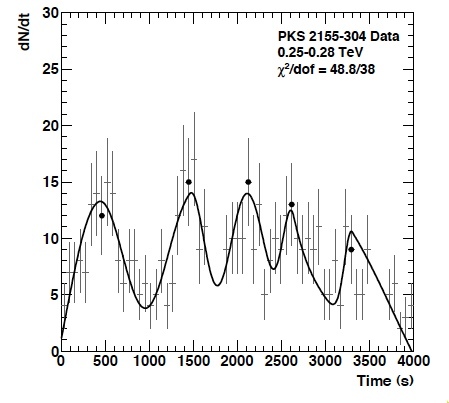 The light curve of gamma-rays in the huge flare of the blazar PKS 2155-304 in 2006 can be used to search for a Lorentz-invariance violating variation of the speed of light with photon energy, which would cause the peaks in the light curve to systematically vary with photon energy. While no gamma-ray bursts were detected with H.E.S.S. 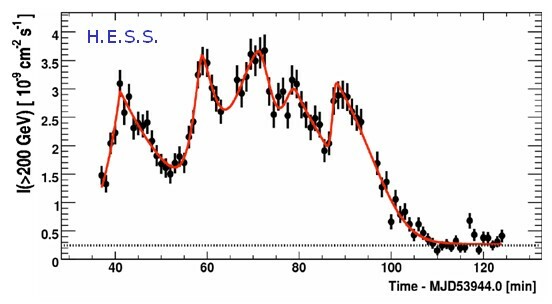 so far (or with any other ground-based gamma-ray instrument), the huge flare of PKS 2155-304 in 2006 (see SOM 9/2007) provides a suitable burst source, at a redshift of 0.11. The outburst consisted of at least 5 distinct flares with risetime on the minute scale. A first search for effects of Lorentz violation was published by Aharonian et al. (2008), comparing the light curve in two distinct energy bins, from 200-800 GeV and above 800 GeV. Obviously, an analysis in two such coarse energy bins does not make optimum use of the information contained in the thousands of gamma-rays detected during the flare, with energies ranging up to several TeV. Therefore, an updated analysis has been untertaken, using in a likelihood fit the detailed information about the arrival time and energy of each individual photon, and adding an energy-dependent delay as a free parameter, following Martinez & Errando (2009). Fig. 1 shows, in a narrow energy band, the measured light curve and the analytical parametrization used to describe the light curve. Like the orginal analysis, the new analysis does not find an evidence for violations of Lorentz invariance, but the resulting limits are significantly improved. For the linear model, e.g., the likelihood that the data set is described by a given delay parameter is shown in Fig. 2; as a result, the arrival time is found to vary by -5.5+-7.1 sec per TeV energy, consistent with no dispersion and resulting in a limit on the mass scale of quantum gravity of about 2.1x10^18 GeV, or 17% of the Planck scale, the best limit obtained so far with TeV blazars. Extensive systematic tests were carried out calibrate the algorithm and to ensure that energy-dependent delays are properly reconstructed (e.g. Fig. 3). We note than all such limits rely on the assumption that there is no intrinsic variation of the gamma-ray light curve at the source, e.g. due to the acceleration mechanisms. Such intrinsic effects might fake or hide effects of Lorentz invariance variation. A positive detection would hence require demonstration that effects scale with source distance, and are hence related to photon propagation and not photon production. Fig. 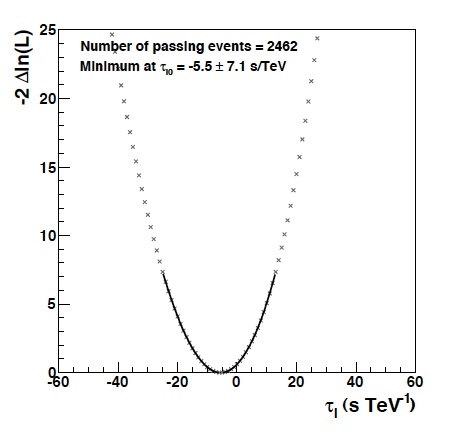 1: Light curve of PKS 2155-304 in the 0.25-0.28 TeV energy band, together with a parametrized shape. Fig. 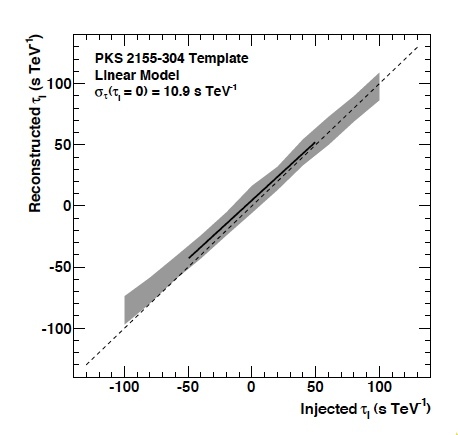 2: Likelihood that the energy dependence of the PKS 2155-304 light curve is described by a given given delay in units of sec/TeV, assuming a linear energy dependence. Fig. 3: Calibration curves for the algorithm using simulated light curves, showing how an injected time delay (varying linearly with energy, in units of s/TeV) is reconstructed. The shaded region indicates the 68% error band.